Lemon balm is a mild sedative that will help you relax. Steeped in hot water it makes a lemony tea and can be used alone, or in combination with other less flavorful herbs such as valerian and chamomile to induce sleep. In addition to promoting sleep, lemon balm has been found to be helpful in treating stress, cramping associated with menstruation, mild depression and nervous headaches. Preheat oven to 400°. Chop 2/3 of the herbs and combine with the butter, salt, and pepper. Rinse chicken and pat dry. Loosen the skin in several places and insert the herb butter underneath. Rub chicken with salt, pepper, and garlic powder. Insert the remaining herb sprigs into the cavity of the chicken. Place breast-side-down in a roasting pan. Bake 30 minutes, then turn chicken over. Bake about 20 minutes longer. Roasting time will vary with the size of your chicken. Test for doneness with a meat thermometer. The internal temperature should be 185°. 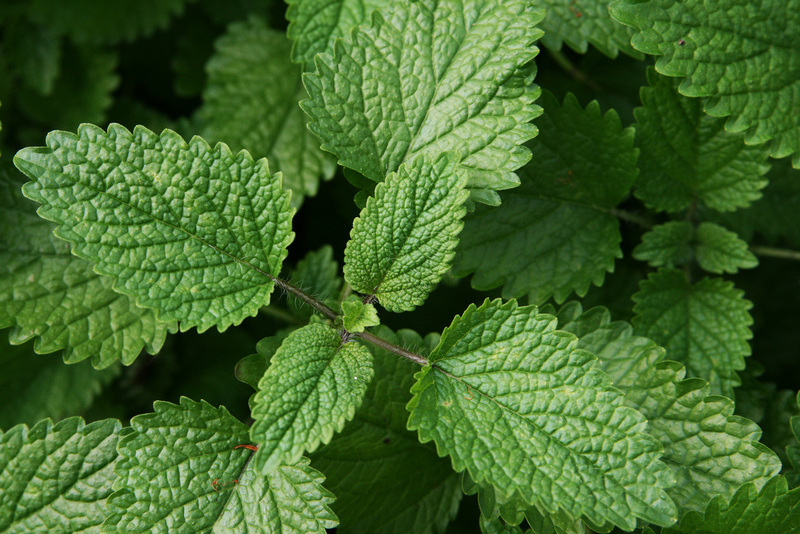 Stack the lemon balm leaves together and roll, then with a very sharp knife cut thin strips, and then chop finely. Combine with the other ingredients and serve with steamed vegetables or mixed salad greens.